Teaches students how to understand analytical results and how to use quantitative manipulations, preparing them for the problems they will encounter. Exploring Chemical Analysis provides an ideal one term text for non chemistry undergraduates. Its coverage of analytical and problem solving methods teaches students how to understand analytical results and how to use quantitative manipulations, preparing them for the problems they will encounter in fields from biology to chemistry to geology. The book contains coverage of chemical equilibrium in the areas of activity, systematic treatment of equilibrium, solubility, EDTA titration curves, and redox titration curves. The new third edition provides an enhanced Solutions Manual, a new chapter on Quality Assurance/Quality Control, and improved coverage of spectrometry and chromatography. 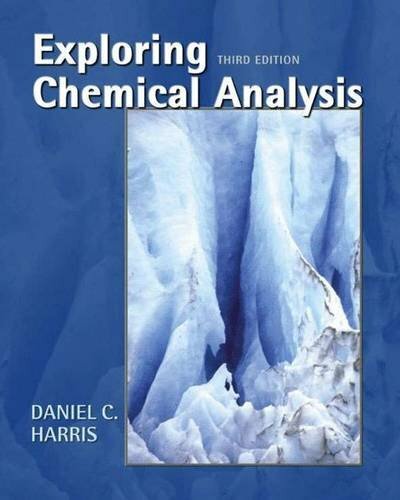 In addition to giving students the fundamentals of chemical analysis, the book has an abundance of new applications and research in the field, making Exploring Chemical Analysis, 3rd edition, a text that students will be able to use and draw upon again and again in all future science courses. The website at http://www whfreeman.com/exploringchem features online quizzes, PowerPoint files, supplementary problems and answers, downloadable spreadsheets, living graphs, annotated web links, lab experiments and supplementary topics.